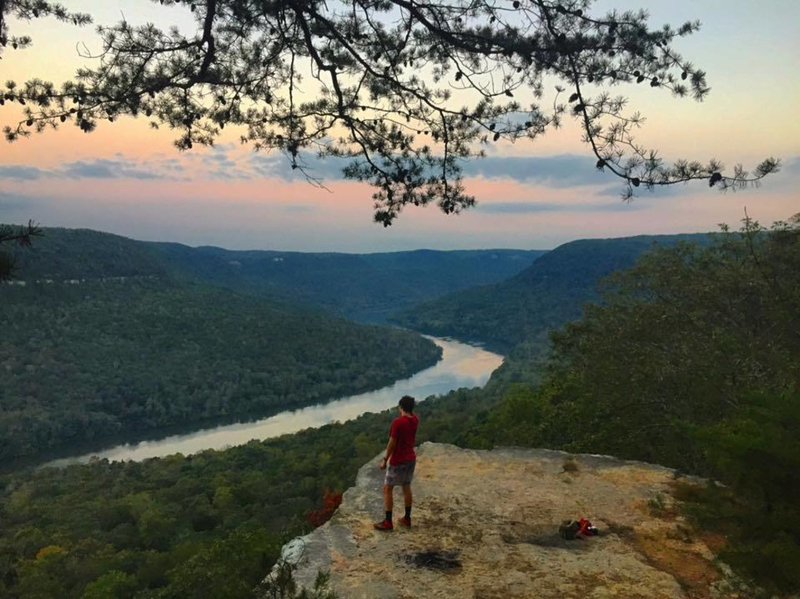 This 10-mile loop, located in the Prentice Cooper Wilderness Area, offers breathtaking views of the Tennessee River Gorge and wonderful hiking and trail running opportunities. This (almost) 10-mile loop offers breathtaking views of the Tennessee River Gorge, giving trail runners and hikers a fantastic option close to downtown. Limestone bluffs and cascading streams compliment the rolling mountains and hills, and the promontory of Snoopers Rock offers an unmatched panorama of the Grand Canyon of the Tennessee. The Mullins Cove Overlook affords a corresponding view of Mullins Cove where it joins the river gorge. The entire trail is part of the Prentice Cooper Wilderness Management area, and the area is closed during scheduled hunts. Check the upcoming hunting dates before your visit.The singletrack trail is soft, but often technical, and runners will enjoy fast stretches as well as those that require more careful attention. There are some rather steep climbs, but the corresponding downhills more than make up for the physical exertion required. During summer, the trail can get quite overgrown, so runners who can't stand spiderwebs would do well to stay behind someone else. If you're allergic to poison ivy, be sure to keep an eye on your footsteps - and pack TecNu for a post-run cleansing. Mullins Cove is a favorite of many local runners and the site of Rock/Creek River Gorge Trail Race. By setting up a shuttle at the Snoopers Rock parking area, runners and hikers not ready for the full ten mile loop can split the distance and enjoy a 6.3 mile or 3.5 mile one-way trip. The trailhead is on the graveled Tower Drive in Prentice Cooper State Forest. See Cumberlandtrail.org for directions and trail details. Check the upcoming hunting dates before your visit.